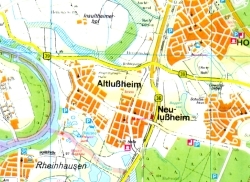 As noted in Eighth Generation, several Engelhorns immigrated to the United States from the village of Altlussheim between 1847 and 1866. Those who emigrated included: two brothers with their families; a third brother, then single; two unmarried sisters; and eight of the nine children of a fourth brother who stayed in Germany. Although other Engelhorns immigrated at different times to other parts of America, the following chapters chronicle only those who eventually settled in Allamakee County, Iowa, and the descendants of # 209 Peter Engelhorn (The Peter Line) who emigrated from Neulussheim to Logan County, Illinois in 1869. The exact motivation for the Engelhorns to emigrate from Germany has not been recorded. One reason may have been the opportunity to improve their social and economic standing. Escape from military service may have been another. At the time, in Europe, there was considerable political upheaval and social changes were taking place in both the industrial and agrarian communities. A Germanic confederation was in place from 1815 to 1866 under Austrian hegemony. In Baden in February 1848, the people's assembly demanded freedom of the press and the judiciary, the right of association, and a parliament. The Palatinate Insurrection of March 1848 (a revolt by the peasants) threatened the aristocracy. Political reforms were demanded and there was a nationalist movement for a united Germany. It failed and Prussia became a leader of German unification following the Seven Weeks War against Austria in 1866. The German Empire, a federal state dominated by Prussia, was proclaimed at the end of the Franco-Prussian War in 1871. In the United States, the American colonists had declared and obtained their freedom in the revolution of 1776. Their Constitution and Bill of Rights were adopted in 1791. With the rights of man proclaimed in the United States, a growing agrarian and industrial community offered economic opportunity to all. As a result of the political and social turmoil in Europe, in contrast with new freedoms in the West, large numbers left Europe in the 1840s and 1850s and immigrated to the United States. Multitudes from Germany landed at New Orleans, and traveled up the Mississippi River to St. Louis and points north to settle on government land which could be purchased at low prices. Four letters from Johannes written in 1852 document his group's trip to America from Germany. The Engelhorns' exact arrival dates in Allamakee County are not known. County records show that Johannes Engelhorn came in 1852. Johann Mathias is listed in the 1856 Iowa census as having been a farmer in Iowa for three years, placing him there in 1853. Thomas Gottlieb Engelhorn, with children born in Pennsylvania, was there in 1851. 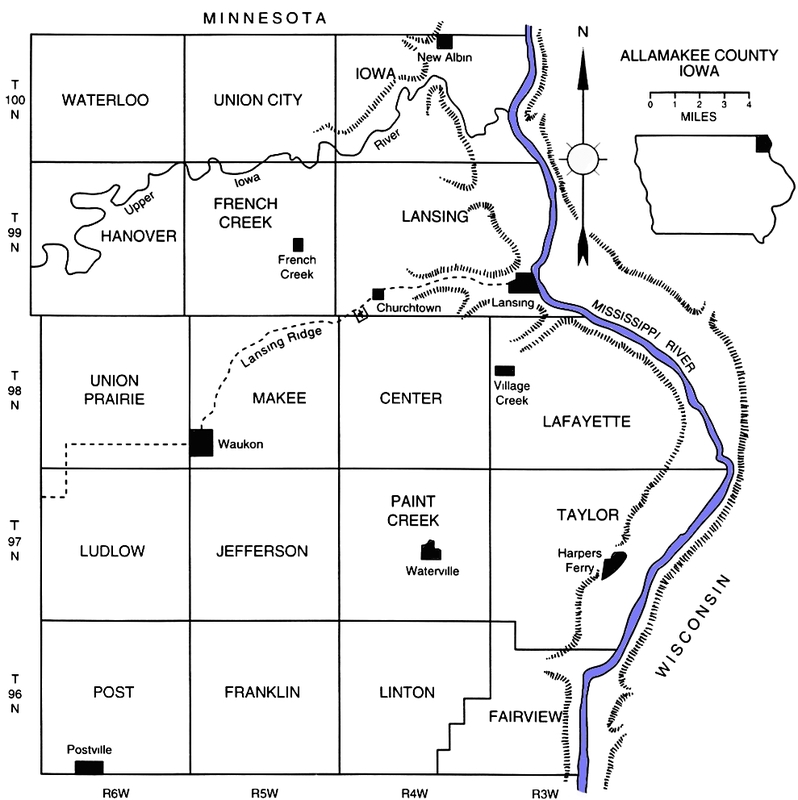 They purchased land in Allamakee County in 1853, 1856, and 1864. Three Engelhorn families were recorded in the census of 1856 and five in 1860. After arriving, purchasing land, and building homes, they followed their chosen occupations as farmers and craftsmen, and took part in community affairs. "Humbolt Lodge, No. 61, A.O.U.W. was chartered April 11, 1876. The charter members were: Martin Engelhorn, John Gruber, J.K. Engelhorn, Thomas Gruber, Jakob Dorrmann, and Engelhardt Bartheld." (Those named, other than Engelhorns, were married to Engelhorn women.) The German Evangelical Congregational Society of Lansing Ridge was incorporated 19 October 1868 with the following named trustees: Frederick Lenz, Johann Engelhorn and Isaac Bechtel. The Engelhorns lived in the town of Lansing, and in Center, Lansing, and Makee Townships. 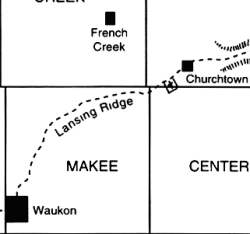 Those on farms lived near the village of Church on Lansing Ridge (sometimes referred to as "Engelhorn Ridge"), where they had carved their farms out of the woods and prairie. This was a contrast with the more developed conditions they left behind in Germany. Numerous accounts and stories of pioneer life, told by the early settlers, have been handed down to descendants and recorded in published accounts. A few comments about pioneer life and early Allamakee County, Iowa history are offered here to remind readers of some of the hardships endured by our ancestors. The early settlers were generally men of limited means. After obtaining some land, the first job was felling trees and hewing logs to erect a dwelling for themselves and their families. The preferred location was near a spring or stream for water. There were few kitchen utensils, furnishings were very simple, and furniture was of the roughest sort. Beds were made of poles attached to the wall of the house and the springs were made of rope. Tallow candles served for illumination. These tasks being done, they broke land for crops. The first crops were generally buckwheat, sod corn, rutabagas, turnips, and potatoes. If the breaking patch was large enough, spring wheat and oats might be planted, but buckwheat was the staple and buckwheat pancakes was a standard dish. Crops were sown by hand. Grain was cut with a scythe, threshed with a flail, and cleaned with sieves. Corn was planted, cultivated, and harvested by hand. Later, hand corn planters and one-horse cultivators were used. At first, grain threshing was done with a flail. Horses and oxen were also used to trample out the grain. Threshing was usually done in late November and early December when the sheaves could be laid out on the frozen ground. Machine threshing was not done until 1852 or 1853. The first threshing machine was a J.I. Case, brought from Racine, Wisconsin in 1854 or 1855, across the frozen Mississippi River in the winter on sleighs. Game was plentiful, there being large populations of deer in the 1850s, 60s, and 70s. Wolves, foxes, wildcats, and skunks were also abundant and strychnine was frequently used to exterminate them. Prairie hens, quail, and pheasant were easily shot or trapped and provided valuable variety to the diet. Other wildlife noted as abundant in the early days included elk, panther, black bear, otter, muskrat, raccoon, mink, weasel, and small mammals such as gophers, shrews, voles, mice and rats. Gathering of wild plums, other fruits, and berries supplemented what was grown in the garden. Travel by horse or ox team to market was a hardship along muddy and rutted dirt roads. Insects and disease were a constant threat and annoyance to crops, livestock, and people alike. Hot summers were a trial with no screens to keep out flies and mosquitoes. The pioneer wife made all the clothes for her family; evenings were spent knitting and mending clothing. During sickness and childbirth, she served as physician and nurse, not only at home but also in the home of an unfortunate neighbor. She tended the vegetable garden, made bread, cooked for the family, put up food for the winter and, until a school was established, educated her children. Women were not treated as equals, but a woman's labor was as grueling as a man's and there was a notion of equality in the maintenance of the household. In 1856 Lansing was the most important town in Iowa north of Dubuque on the Mississippi River. It was a natural landing for a large section of very fertile country. The town was incorporated in 1864. 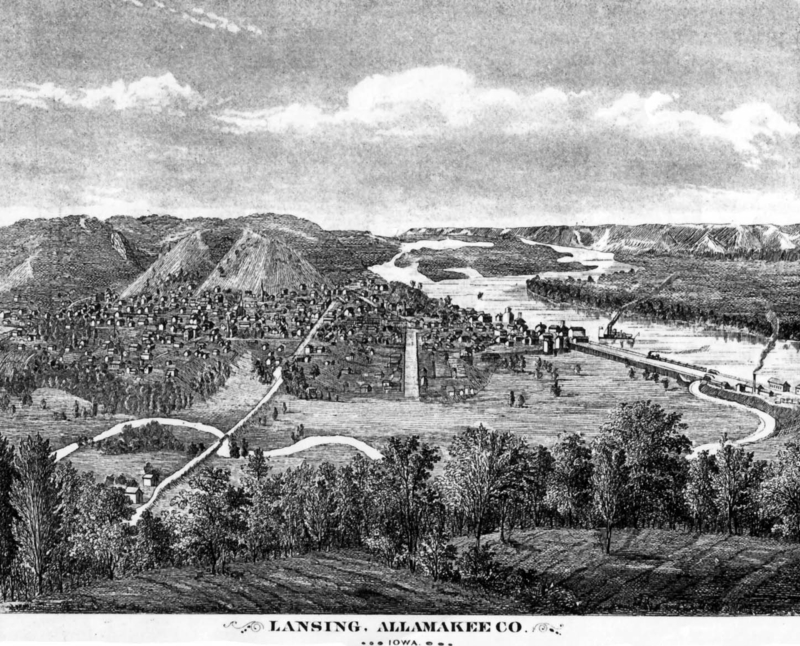 In the early days Lansing's manufacturing industries consisted of a steam sawmill, a pork packing house, and a brewery. Years later the town became known far and wide as one of the best wheat markets on the river. Until 1872 the community was greatly dependent for its support on wheat. Soon after 1872 the wheat crops began to fail and continued to fail for several years. This may have been one of the motivating factors causing some of our ancestors to leave for Dakota, Nebraska, and other points west. Many farmers were compelled to leave their farms and begin life farther west with little or nothing. Prior to construction of a railroad, the only route of communication with the world at large was on the river. At first, steam packets came only every two weeks, but seldom stopped unless for wood or to land passengers. The mail was sent from Galena, Illinois and was often just thrown from a passing boat, weighted with a stone picked up at the last landing. As the town grew and business picked up other boats were added until a packet came daily. The event of the day was the landing of the steamboat. With the closing of navigation each winter this means of communication was suspended until spring. Such business that had to be done was carried on by teams driven on the ice across the river from Lansing to Prairie du Chien, the nearest railroad town. Ice conditions were always uncertain and business dependent on transportation to and from the east was highly influenced by the weather. In 1872 a railroad was constructed along the west bank of the river from Dubuque. By 1882 the commerce of Allamakee County included one large sawmill, one foundry, one brewery, five creameries, numerous wagon and plow shops, a brick works, flour mills, and one woolen mill. Some of the children of our first immigrant ancestors moved from Iowa to Dakota Territory, Nebraska, Kansas, Montana, and Oregon. Their reasons for leaving Allamakee County may never be known; however, we can speculate that perhaps Iowa was becoming too crowded, or that cheap land was becoming available elsewhere. The crop failures of 1872, mentioned above, may also have been a factor. By the 1870s immigrants were finding that most land available for homestead was on the Great Plains, where land prices were cheaper. Several of our relatives acquired land through exercising their rights under the Homestead Act. Another method of gaining land became available in 1873 when Congress passed the Timber Culture Bill, a law intended to promote the planting of trees on the Great Plains. The Timber Culture Bill did not require an applicant to live on the claim. However, only one tree claim could be made per section, and, if there was already a homestead in that section, the tree claim right did not apply in that section. If the settler could find an open section he could, through a combination of homestead, pre-emption, and tree claim, obtain 480 acres for very little capital outlay. Several of our relatives in North Dakota obtained land under the Timber Culture Bill in addition to their homestead lands. The common ancestor of all the Engelhorns who came to Allamakee County, Iowa was #129 Johann Marcus ENGELHORN II, 1782-1869, Bürger, farmer and magistrate in Altlussheim, Germany. [See Eighth Generation] Johann Marcus II stayed in Germany. His oldest son, Johann Thomas III, also stayed in Germany, but eight of his nine children emigrated. Four of Johann Thomas's siblings also emigrated, two already with families of their own. Eight of the nine children of Johann Thomas ENGELHORN III: Thomas Gottlieb, Johann Martin, Anna Margaretha, Julius Jakob, Elisabeth, Johann Thomas, Christina Wilhelmina, and Johann Marcus: The Thomas Line. Johann Jakob ENGELHORN, his wife Elizabeth STEPHAN, and their seven children: Marie Agnes, Mathias A. 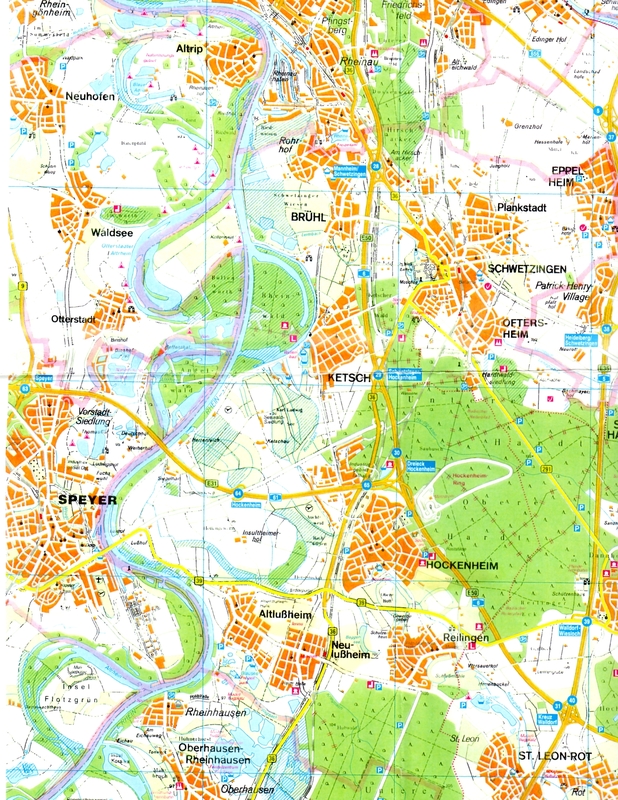 (Johann Mathias), Johann Thomas, Christine Margaretha, Johannes, Johann Jakob, and Thomas Gottlieb: The Jakob Line. Johann Mathias ENGELHORN, his wife Anna Margaretha SCHWECHHEIMER, and their seven children: Mathias, Elizabetha, Eva Maria, Johann Thomas, Johann Conrad, Ludwig (Louis), and Julius George (Georg Julius): The Mathias Line. Christina Margaretha ENGELHORN: Christina RUCH. She did not have children. Johannes ENGELHORN: The John Line. Christina Wilhelmina ENGELHORN : Wilhelmina Platz. Dictionary of American History, Charles Scribner's Sons, New York, 1976, Vol. III, pp. 113-114 and Vol. VII, pp. 295-297; Pioneers and Progress; Minnewaukan, ND and Countryside, Minnewaukan Historic Book Committee, Minnewaukan, ND, 1983. Federal Census Records for Allamakee County, Iowa. Census Records of the State of Iowa, Allamakee County, 1856, 1860, 1870, 1885, 1895, 1905, 1915, State Historical Building, Des Moines, Iowa. History of Winneshiek and Allamakee Counties, Iowa, W. E. Alexander, Western Publishing Company, Sioux City, Iowa, 1882. A Complete History of Churchs Ferry, compiled by the Churchs Ferry (North Dakota) Sun newspaper, about 1900.